Meet S5 0014+81, one of the most powerful things in the known universe. This colossal beast is actually a distant quasar (some 12.1 billion light-years away). If you aren’t familiar with quasars, it is generally believed that they are produced by supermassive black holes consuming matter, and it is this consumption that makes quasars, or “quasi-stellar radio sources” the brightest objects in the known universe. As quasars consume matter, the material it is feeding on spins inwards towards the central black hole. As this material gets closer to the singularity, it spins faster and faster, causing significant friction and, thus, heat. Ultimately, the heat is so extreme that it gives off massive amounts of light and other forms of radiation, such as x-rays, light in visible parts of the spectrum, gamma rays, and radio waves. Ultimately, quasars are so bright, and they emit so much energy, they are almost beyond comprehension. And S5 0014+81 is one of the most powerful quasars that we’ve ever discovered. So, just how bright is it? Well, our solar system is about 2 light-years across. The sun isn’t even a light-years away from us—it stands about 93 million miles (150 million km) away. Yet, if this quasar was 100 light-years away, it would appear as bright as the Sun…despite being 63 million times more distant. 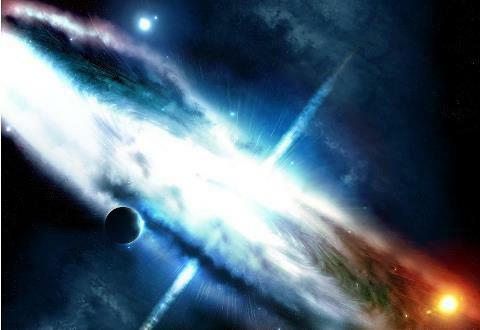 The quasar’s luminosity is about 3 x 1014 (300 trillion) times that of the Sun. If that isn’t enough, it is over 25 thousand times as luminous as all of the 200 billion stars of the Milky Way Galaxy combined (scientists estimate that there are between 100 and 400 billion stars in the milky way). These staggering figures make this quasar one of the most powerful objects in the known universe. Abiogenesis: 7 Scientific Theories for the Origin of Life… and One New One!